Should You Pay for Your Home in Cash Upfront? Find Out Here! Should You Pay for Your Home in Cash Upfront? Generally, people buy homes by taking out mortgage loans, which they will pay back over a number of years. Those who have better financial situations have the option of paying upfront for the home, and not have to deal with the hassle of making mortgage payments each month. Paying cash upfront for a home if you have the financial means sounds good and has its advantages, but it also comes with a few disadvantages that have to be taken into consideration before making this step. Before investing a large sum of money into a home, you should take a close look at your financial situation and your long-term investment strategies. Before buying a home with cash, try to evaluate all your assets and financial obligations in order to determine if you really can afford spending all that money at once. Make sure you have enough money to continue paying off any debt that you might have, health insurance, school tuition and other current and future expenses. If you come to the conclusion that you can afford paying upfront for a home, the next step would be determining how much you can realistically spend on a home. Aiming for a budget that’s smaller than what you can really afford is a good idea, because there will probably be some fees and costs that you will overlook. Start searching for a home in the desired area or hire a real estate agent to do it for you. Hiring a real estate agent means that you will have to pay an extra commission, but it will increase your chances of finding a home quicker, and maybe even cheaper. After finding a home, it is time to make an offer. If the appraiser agrees with the selling price, make sure that you offer a deposit immediately. Also, be prepared to provide documentation that proves you can afford to buy the home in cash. Arrange a closing date and prepare a check for the full amount of the price that was agreed upon. The largest advantage to buying a home with cash is that you won’t have to pay interest on a loan. At 4 or 5 percent, interest rates seem low, but they will become tens of thousands of dollars over time. Not paying interest can save you a lot of money that can be invested into something else. Another advantage which will save you a nice sum of money is that you won’t have to pay closing costs, like you would when taking out a mortgage loan. Application fees, mortgage insurance and other fees can cost you several thousands of dollars, even up to 4 percent of the home price. Last, but not least, paying cash for a home offers you security. If you lose your job or have other financial trouble, you won’t be in danger of losing your home. 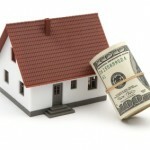 The biggest disadvantage is that you will have to spend a large amount of money at once when buying a home in cash. That money could have been invested into something that would yield a better return. Another disadvantage is that, if you come across financial hardships in the future, it would be more expensive for you to borrow money than it would be for someone with a mortgage. A third disadvantage would be that home owners who have bought their homes with cash upfront don’t receive any tax deductions, unlike those who have bought their homes with a mortgage. Paying cash for a home has its advantages and disadvantages, but your decision should also be largely influenced by your financial situation. Buying a home with a mortgage loan while interest rates are low might be more beneficial, but, as interest rates rise, it makes more sense to pay for your home in cash upfront.